Last Thursday, the Jim & Tabitha Furyk Foundation held a community event at Ponte Vedra Concert Hall where children and their families were invited to pack holiday bags. It has become an annual tradition for many families, and it’s one of the few volunteer opportunities where kids of all ages can actually participate. What started Hope for the Holidays? 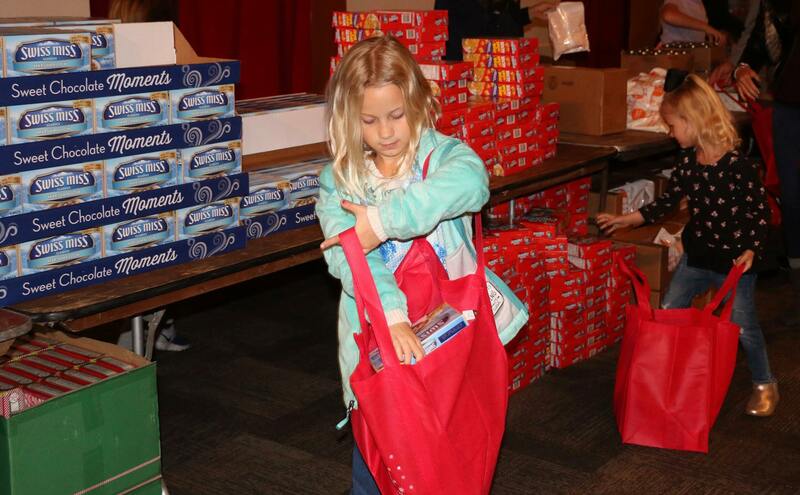 A young volunteer helps pack meals for those in need during the holidays. The event started six years ago when we, through the support of Blessings in a Backpack program, realized the need in our community for food. And, there was a lack of opportunity for young kids to actively volunteer. The first packing, which took place in Sawgrass Village, was a success of spirit and community, despite the last minute thunderstorms. Last week the foundation was able to move the event indoors to Ponte Vedra Concert Hall and over 500 people came out to pack. The holiday bags, which included a canned ham, green beans, chicken broth, gravy, mashed potatoes, stuffing, captain crunch, oatmeal cups, hot cocoa, candy canes, etc. were delivered to 24 schools currently enrolled in the free and reduced lunch programs, plus eight other local charities who support children in the greater Jacksonville area. One of the touching stories we heard after the event was from a student who had volunteered at Hope for the Holidays then went to school on Friday and saw classmates taking the red bags home. What else does the Furyk Foundation do? Each year we hold one major fundraising event, Furyk & Friends Concert and Celebrity Golf Classic in March. The money raised there is then used to fund project specific goals for our charitable partners. For instance, last year we were able to provide strollers and car seats through Operation Shower ,a bi-annual event held during the Web.com Championship and the Players Championship to support military families. We also supplied the salary for two child life specialists working with Community PedsCare and delivered over 1000 students a meal on weekends through First Coast Blessing in a Backpack. Other charitable initiative’s we support include projects with Wolfsons Children’s Hospital, Teach for America, and Malivai Washington Youth Foundation. This year we also were able to contribute to the CAPabilites Art Program at Oak Hill Elementary; gift 100 foster care children with a tablet over the holidays ; and we are looking forward to providing a garden tower for an elementary school in downtown Jacksonville. More information about what we do and who we support can be found on the website. As we wrap up Hope for the Holidays and start gearing up for Furyk & Friends, our hope is to sustain all the programs we are part of; grow the number of children we can feed; and help fund complex medical issues though our endowment at Wolfson Children’s Hospital. And, fingers crossed will be able to announce the Payne Stewart/Furyk Scholarship. Most of the information on sponsorships and who we support is on the website www.jimandtabithafurykfoundation.com. If you have a charity we should consider supporting or have other questions please email Liz at furykfoundation2@comcast.net.